Hardworking, dependable, self-motivated. These are just a few of the words to describe Elizabeth Vishnefske. The sophomore social work major was recently named Cowley College’s November Student of the Month. Vishnefske is the daughter of Mark and Patty Vishnefske of Mulvane, KS. She has three sisters, Dara 31, Michelle 26, and Karen 24, and three brothers, John 30, Paul 22, and Andrew 16. She attended home school in Mulvane and visited Cowley during Home School College Experience day. During her first year at the school, Vishnefske was a member of the women’s soccer team. She also accumulated 190 hours of community service with Cowley College’s ACES (Academic Civic Engagement through Service) organization and volunteered her time for the Relay for Life event and food packaging events. “I learned a lot about myself through the ACES organization,” Vishnefske said. She is currently involved in Phi Theta Kappa, Creative Claws, Act One, Cowley Theater, Media Club, Chi Alpha, and is a Cowley Tutor. “She is always seeking positive solutions that benefit all parties, Liz is, without a doubt, a credit to our college,” Cowley Theatre Director John Sefel said. Vishnefske has a grade point average of 4.0, is a member of the President’s Honor Roll, and was named an Academic All- American while a member of the 2014 women’s soccer team. She is currently involved with the Theatre Department’s fall musical “You’re a Good Man, Charlie Brown”. 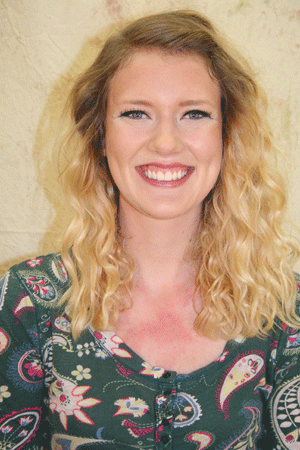 “The Theatre Department at Cowley is very supportive and John (Sefel) is a great teacher,” Vishnefske said. She has also enjoyed working with ACES sponsor James Fry and Humanities Department Chair Marlys Cervantes. “They are great teachers that care about you as a person,” Vishnefske said. In her free time she enjoys running, painting, and being involved with the Sacred Heart Catholic Church in Arkansas City. Vishnefske is honored to be named Cowley College’s November Student of the Month. “This honor makes me realize I am on the right path and makes me want to push myself even more,” Vishnefske said. After Cowley, Vishnefske plans to transfer to Wichita State University to earn a Master’s Degree in social work and pursue a career working with children.